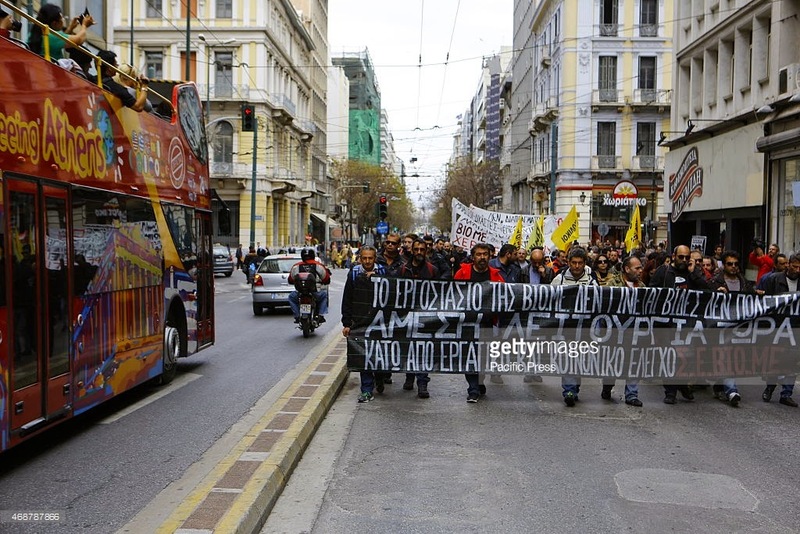 STADIOU STREET, ATHENS, ATTICA, GREECE - 2015/04/06: The 'Caravan of Solidarity' stands outside of the Ministry of Labor. Photo by Michael Debets/Pacific Press. The goal of this Caravan was for VioMe to force a meeting with the Minister of Labour and demand an immediate solution for the struggle of the workers, as promised by Tsipras himself when he visited the occupied factory about two years ago. Other workers participated not only to support VioMe but to demand of the government solutions to their own unresolved problems. The Caravan arrived in Athens Sundayevening – at the National Radio TV Channel ERT in Aghia Paraskevi. The previous government of the Right and PASOK, on the troika’s orders, had fired everyone and closed ERT. The Caravan got a warm reception from PROSPERT, the union of journalists and technicians. It then entered Syntagma Square in the capital’s center to hold a press conference. Each workers’ organization and union in the class action took the floor. A demonstration was organizedMonday morning heading for the Ministry of Labour. But while the Minister knew the Caravan was coming, and had just said on the radio that he would welcome it, he “suddenly” had “to do a special inspection of working conditions at Athens’ airport” miles away! Thank you for this report. Quiet on the internet. Where is Syriza headed? Isn't easy understanding what is going on.